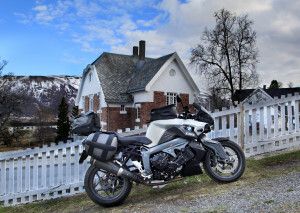 As I have promised last time, this post will be mainly about technical details of a K1300R. I will try to avoid quoting from Wikipedia and explain everything based on my personal opinions and my particular way of ‘feeling’ the bike. In order for all of you to have a better understanding of what I’m about to write, I will have to go a bit back in time, more specifically to when I was buying my first motorbike ever. It was a Honda NTV 650 and I remember many friends of mine who shared my passion (more or less) told me that a 650 cc was too dangerous of a motorbike for a beginner. Basically I’ve been advised by people with more experience to go for something that I could have a better control upon, but my mind was already made, so …stubborn as I am… I ended up with my Honda. 650cc, 50hp, 50 Nm: these were the ‘abilities ’of my Honda, which is still alive and functional, now in the possession of my brother, who seems to share my passion as well. I like to think that this is my family’s legacy : my grandfather ( who had an old DNEPR MT11 ) passed it on to me and I passed it on to my bother. I had the Honda for 3 years, time during which I have made little over 40 000 km with it. We were inseparable, regardless of the weather. I have so many stories to tell from back in the day, so sometime in the future I will share them with you as well. Hope you’ll enjoy reading them as much as I’ve enjoyed ‘living’ them. I don’t know if it’s that I’m lucky or that I’m very careful and calculated in traffic, but I never had any crashes or go through worrying circumstances on/with it. It wasn’t because I was driving it too fast or to slow, but because I have respected the speed limitations and acted as if I was driving a car. I believe this is the secret of managing not to crash or put oneself in danger. After 3 years of thinking and breathing only motorcycles, there came this really ‘dark’ period in my life, where for almost 4 years I didn’t even get on a bike. 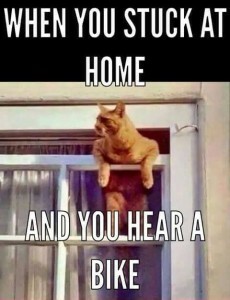 This is how I looked every time I heard a bike 🙂 I am just guessing here that this feeling may be known to some of you. Last year I went ‘browsing’ to one of the local motorbikes stores (which happens to be one of my main places to be it seems), and I saw this orange K1300R. It had a certain aura, a certain something to it that I just can’t explain. All I knew was that I had to have it! I went home and presented the situation to my girlfriend. She obviously didn’t share my enthusiasm and tried to lay out reasons why I shouldn’t think of owning a new bike. I sort of listened to her so my orange dream was sold. It kind of pissed me off that I have let myself pulled into my girlfriend’s logic. How could she really understand what I was feeling!? So, since I knew she wasn’t completely against it, I convinced her to come on a drive test with me. Good thinking on my behalf that was! She really liked that she could feel the road in a never before known way until then, that she could smell the flowers and feel the sun more intensely, that she was experiencing a new way to define ‘freedom’. So, having her on my team this time, I went and bought my motorbike, which you guys know as Sandy by now. Before I drove my K1300R, I thought that Honda was the most powerful ‘wheels’ out on the tarmac. Boy was I wrong! The K1300R has 175 horse power, 140 Nm and 1300 cc’s. It accelerates from 0 to 100 in less than 3 seconds and from 0 to 200 in 5,4 sec. All these may be just random numbers for some of you. One is ought to test one once in order to have a real idea of what I’m trying to say here. I am not a man of speed, I don’t drive for that kind of rush. 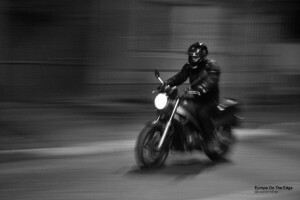 But as any man out there who owns a motorbike, I like the idea of knowing that IF I wanted to reach a certain kind of speed in a very short lapse of time, it were possible. Cruise speed is where I feel most comfortable when driving, especially when there’s a long way ahead. 100 to 120 km/hour is more than enough to make one biker feel safe and enable him/her to enjoy the landscape and get familiar with the ever changing surroundings. Not many roads are speed friendly, especially up here in Norway, so I beg of you…don’t ask me about the top speed Sandy can reach, for I have no idea ( ashamed ). I have only saw it running like the wind on YouTube videos. Although every car and motorbike I have owned before was tested at top speed on certain highways in Germany, I will confess to you without any shred of shame that I am not keen on testing this one. Yeah, I love her, she probably loves me…but WHAT IF SHE LEAVES ME BEHIND (LOL). Leaving all jokes aside, there’s only a few weeks left before my journey will begin, time more than enough to go on with my physical and mental training. I have to figure out a way to put all the stuff necessary for such a long trip into just 100 – 125 L.
By the way, after taking into consideration some of your comments on a forum, I’ve decided to listen and take the trip up to 50 days. It should be enough time to meet some of you guys along the way and share a cup of coffee and good story. I could also your help with advice as to what is worth visiting in the places I’ll be passing through. I really hope you friends can help me with this. Copyright © 2015 A Guide's Journal, Inc.